Let’s start off with a little pop quiz. Where did Alis Hill gain many of her favorite childhood memories? A) At the checkout counter of Toys R Us. B) At the local Baskin Robbins’ corner booth. C) At the Hill’s Trucking, Sand and Gravel Co pit. If you picked C, you nailed it! This New London, CT, girl grew up spending a lot of time at this place co-owned and operated by her grandfather and father, gaining experiences that began to shape her future. Her interest in mechanics took a twist toward diesel performance when she later met and began dating Fred Johnson. Alis started going over to his house after work and lending him a hand in the garage, passing tools and straightening up while he worked on his ‘97 Power Stroke and helped friends with their trucks. As her interest in diesels grew, she decided to give it a shot herself. “We later picked up a first gen and he sent me to Johnson’s Academy of Hard Knocks and Bruises,” she jokes. Come 2011, the couple was officially ready to open their own shop together: Diesel Shop, LLC. Alis’s first diesel was a 1992 D250 4x4 with plus or minus 280,000 miles on it (the odometer only occasionally worked). Affectionately dubbed Shirley Broken, she picked up this retired farm truck when it wasn’t running and later found it was due to an electrical issue—just one of many. So much so, in fact, that she eventually sold her first gen and started looking for a drag truck. “It was a no-brainer. Fred has an OBS Power Stroke, our shop help all had Power Strokes at the time—a Power Stroke it was,” Alis laughs. When she found a “mechanic’s special” slammed 2000 F250 Power Stroke, she couldn’t help it. The truck was coming home with her and the name was already picked out: Mowgli. “I have this knack for buying trucks with transmission issues and Mowgli needed a rebuild. I drove it back from Maine to Connecticut with a two-to-three shift issue, but I was too smitten to care,” Alis explains. She started hunting around and found a secondhand converter, then bought a BTS valve body and sent it to her local transmission shop for overhaul. Next, Alis installed Full Force 238cc injectors and rebuilt/upgraded the turbocharger. The changes haven’t stopped there. Alis went bold and got a Diesel Shop wrapping job, and couldn’t be happier. “Thirty Two Signs did a great job on the wrap; it totally changed the truck’s appeal,” she says. 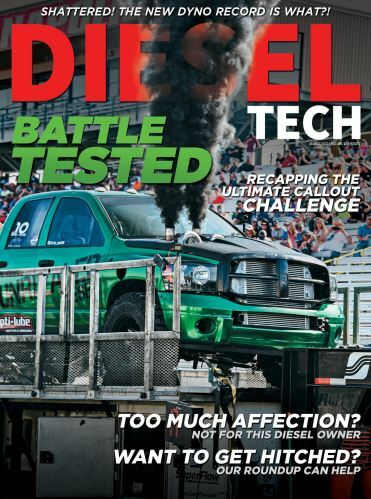 She’s also worked closely with Full Force Diesel Performance on their Dual 7.3L HPOP kit and was elated to have been a part of the research, doing some testing on their 224XLC dynojet and looking forward to hitting the drag strip more than ever. Overall, she’s already noted some great changes from her master list of modifications—even just by upgrading her oil. Throughout her growth in the industry, Alis has had the pleasure of a lot of positive encouragement from everyone from friends and customers to co-workers and strangers. “I have a big family behind me, both in blood and business. I would not have come this far had it not been for the encouraging influences in my life. Thank you to all who have helped along the way, whether it was lending a hand, advice or words of confidence,” she says. If you’re toying with the idea of getting more involved with diesels, Alis has a bit of advice to share. In the meantime, you can be sure to find Alis doing what she loves at the drag strip. Things couldn’t be better for Alis and Fred, now happily engaged and loving their work at the shop while Alis works on teasing even more performance out of Mowgli. When this couple exchanges wedding vows, you can be sure it will go down on the drag strip.